I buried this fantastic recipe along with another fantastic recipe (Gobble Gobble Turkey Meatballs) some time ago. Creamy Orzo with Pancetta should stand alone as a recipe. I made this last night with breaded chicken tenders and fell in love again. As usual, when I find a new recipe, I make it a lot, and then not at all. It’s been a while but I think it will make the rounds again. My son is excited to have those leftovers tonight. It’s a simple recipe that you can play with. If you love pancetta, add more. If you love onions, use two! It also doubles really well. To give the orzo some color and a toasty flavor, you brown the uncooked orzo. I had never done this before and it is a game changer. The pancetta is sold already diced. It’s usually near the deli counter. In a braiser or a shallow pot, melt the butter or heat the olive oil, under a medium heat. Add your onion and sprinkle it with a teaspoon of kosher salt. Sauté the onions until they soften. Add the pancetta and stir. I like to cook the onions and pancetta for about 5 minutes. It may take longer. You want everything to soften. 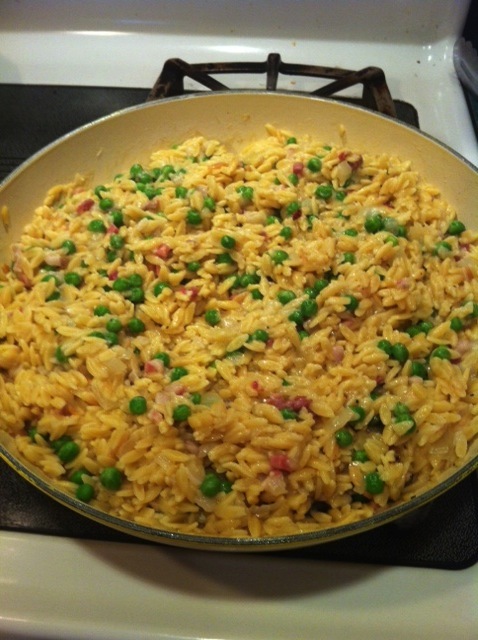 Add uncooked orzo to pan with onions and pancetta. Stir the mixture. The orzo will “toast”. Keep stirring. It will only take about a minute for the orzo to get some color. If it starts to stick, add a little more olive oil. Add the garlic. Stir and cook for about 30 seconds. Add the chicken stock. Stir to combine. Let it come to a boil. Put the lid on and lower the heat. Stir occasionally. You want it to simmer for 20 minutes. The orzo will absorb most of the liquid and fluff up. Take pan off the heat and add the parmesan. Stir. The dish gets creamy with the parmesan. The orzo may stick to the pan, but don’t worry. Add the frozen peas, and put the lid back on. Let it sit for about 10 minutes. Take the lid off and stir. The orzo should not be sticking to the pan. Season to taste. Stir and serve! I like to serve this with a variety of chicken dishes. It makes a great lunch with some chopped cooked chicken. It heats up in the microwave like a champ! I found this recipe on Saveur.com’s website a couple of years ago. I wanted to try to make a few new things that were low-fat. This recipe uses ground turkey and is moist and delicious. I use the Pepperidge Farm Herb Seasoned stuffing bread cubes are that in a bag (not the boxed stuffing mix). These meatballs taste like Thanksgiving dinner in each bite. Preheat your oven to 425 degrees. Coat a 9 x 13 pan with olive oil, sides included. In a large bowl, combine the ground turkey, croutons, cranberries, eggs, bread crumbs, sage, salt and cinnamon. Mix by hand until it’s thoroughly incorporated. Roll this sticky mixture into round, golf-ball sized meatballs. Pack them together firmly. Place the meatballs in the pan so that they are touching. Bake the meatballs for 20 minutes or until they are firm. If you are using a meat thermometer it should read 165 degrees F.
Cool the meatballs for 5 minutes before serving. I also like to serve these meatballs with a delicious creamy orzo dish I make and a salad. These meatballs freeze really well. In a Dutch oven or a deep pot melt the butter or heat the olive oil. Add your onion and sprinkle with a teaspoon of kosher salt. Sauté the onions so they start to soften. Add the pancetta and stir. I like to cook the onions and pancetta for about 5 minutes. This gives the pancetta time to soften and let the pepper and salt help the onions to cook. Add the uncooked orzo to the pan with the onion and pancetta. You are going to let the orzo brown just a little or “toast”. Keep stirring to avoid anything from burning. This brings a wonderful flavor to the finished product. If the orzo sticks to the pan, add a little more olive oil and stir. Once there is some color to the orzo, add the garlic and cook for about 30 seconds. You don’t want it to burn as them the taste is bitter. Add the chicken broth to this mixture. If you have homemade stock that will add wonderful flavor, but I often use store bought chicken broth. It is still wonderful. Try to use low sodium chicken broth, as the Parmesan is salty. Stir to combine all ingredients. Put the lid on and simmer for about 20 minutes. Stir occasionally. The orzo will fluff up and the chicken broth will be absorbed. Take the pan off the heat. Add the Parmesan and stir. Once the Parmesan has melted, stir in the frozen petite peas. I add a handful or more. Cover the pan and let the peas cook. After about 5 minutes, take off the lid and stir. I must tell you that I always double this recipe. My family loves this. It is great reheated in the microwave. I often serve this with a roast chicken and a tossed salad. Simple and delicious!